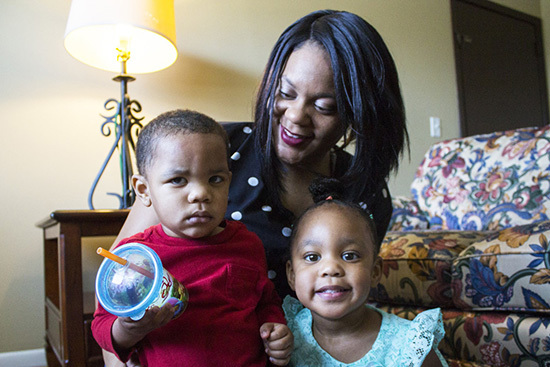 SHIFT Shatrece Coleman, 24, with her children Dakotah, 2, and August, 1. August is legally blind. Not pictured: dad Dakotah Hunter. Family was homeless before coming to SHIFT. Growing up, Shatrece never saw a stable, healthy adult relationship. Her mother was addicted to drugs so Shatrece bounced between family members, frequently changing schools. She wanted more out of her life, so she has worked since graduating from school, and wanted to build a healthy and stable relationship with her fiance. But their combined income wasn’t enough to pay their rent. Then her mother was arrested, leaving Shatrece homeless, anxious, depressed — and pregnant with her first child, Dakotah. Everything changed when she found SHIFT, she said. 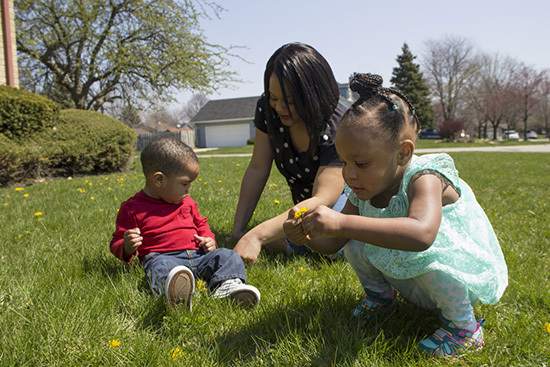 SHIFT — short for Supportive Housing for Families in Transition — is a DuPage County partnership providing homeless families with housing placement, complemented by employment counseling, mental health services, and other supports to guide them toward independent housing and economic stability. The nearly 20-year-old SHIFT program is part of a continuum of care in DuPage County where three organizations work together to develop and support effective strategies to end homelessness in the county. Catholic Charities provides the housing and budgeting services, the YWCA contributes job counseling, and Metropolitan Family Services provides therapy and psychiatric services. “My therapist has helped me a lot with handling my anxiety so I am able to stay focused for me, my fiance, and our two children,” Shatrece said. Therapy is also helping her cope with the medical and insurance challenges facing her one-year-old son, August, who is legally blind due to a genetic condition and will need medical monitoring for life. SHIFT clients typically have experienced much trauma, and severe depression or anxiety can undermine their ability to maintain stable housing or employment. Metropolitan’s therapists help clients manage and overcome obstacles so they can ultimately achieve independence. Now Shatrece and her fiance have their own apartment with plenty of room, and a yard for Dakotah and August to run, play, and pick dandelions. Shatrece works every day with August to identify things such as parts of his face and the grass outside. “I’ve learned so much from the program,” Shatrece said. “I’ve learned so much from being homeless: to appreciate things, not to take things for granted. How to be a woman, how to be responsible, how to budget.